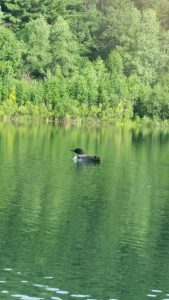 Although I lived many years at the base of the Adirondack Mountains in Holland Patent, NY, I have never seen a loon. I read Loon Lake when E.L. Doctorow published it in 1980. We lived in Upstate New York at the time, but I remember little about the book. I do recall that I enjoyed it. Loons are divers. A loon is the size of a large duck or a small goose. I have made three, 12-mile runs down the Kinnickinnic River, one solo, one with grandson Travis and one with granddaughter Xylia. Invigorating! This morning, Mrs. tVM accompanied me with the kayak to Perch Lake, about 20 miles north of River Falls. I decided it would be easier and more comfortable to introduce the kayak to Mrs. tVM on a lake than on the river. I was undoubtedly correct. We were on the water by 7:30AM. 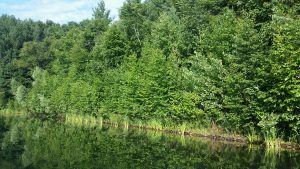 Perch Lake – which I will always refer to as my personal ‘Loon Lake’ is only 45 acres, but as we were the only people on the lake, it could have been 4,500 acres. We were overcome by the serenity that surrounded us and the still, glass-like surface of the water. Mrs. tVM quickly adapted to rowing the kayak, and she found great pleasure in the exercise in the stillness of the environment. After 20 minutes or so, she pointed to the far shore and we watched a bird ‘skipping’ across the surface. He took flight after no fewer than a dozen skips. We watched in wonder as he circled the lake and made a pass directly above us. 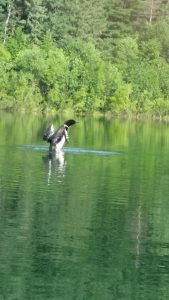 It was a loon, beautiful and graceful. The loon returned to the water and we watched with great interest. Yes – as I have already mentioned – the loon is a diver. He would dive into the water and disappear. No fewer than 30 seconds would pass before he resurfaced some distance from where he first submerged. He watched us with the same curiosity that we watched him. We approached to within a mere 20 feet and he gave no sign of fear. We dared paddle no closer. We drifted together, he and us. After 10 minutes, we bid him goodbye and continued on our way. I have seen the loon. Now, I long to hear his mournful cry. I invite you to enjoy it on the video at the end of the post. Thanks for sharing this cool experience! Discovering new birds or wildlife is quite the treat from a kayak- you got to do this with your grandkids and Mrs! I remember doing this with the heron in Sarasota Fl with my aunt, when she took me out on my first, and to this day probably longest, kayak adventure! I have encountered Great Blue Herons and American Bald Eagles on EVERY kayak trip I have made down the 12-mile run on Kinnickinnic River from River Falls to Highway F. It is an inspiring experience. Gene, thank you for your reflections on the loon. Very beautiful. Obviously, God gives you these mystical moments when you are ready. I love eating perch in the Midwest, it is my favorite fish. Are there actually perch in perch Lake? ?